Back in April, my family and I walked through West Chester, PA, with friends of ours to raise money and awareness in West Chester University’s American Foundation for Suicide Prevention Out of the Darkness Walk. Just a month before, in March we had suffered the loss of our 14-year-old friend of the family, Alec Metzger. In order to try and do any small thing to help the family and to help prevent others from suffering the same crippling sadness and loss, we joined in the walk and effort to raise money. 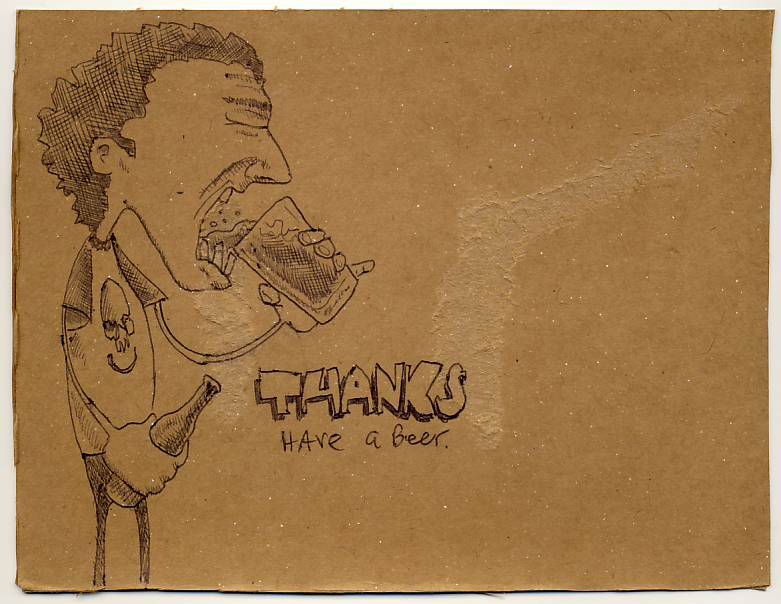 As part of my push to raise funds I offered hand-drawn thank you beer postcards for anyone donating any amount. Thanks to the generosity of friends, I raised $470 and have ten postcards to create. Here’s the first one. All postcards are created on the back of panels from six-pack containers for beer. If you’d like to help the cause by funding awareness and education to help bring light to and remove the shame that comes when a suicide occurs AND get a postcard in return — it’s not too late to donate! Donate here on the fundraising page and I’ll get in touch to get your postal address for a postcard. As I complete the postcards, I’ll continue to post them. Since I’ve been out of the drawing practice for a while now, I’m hoping they improve with time. This entry was posted in six pack and tagged donate, suicide. Bookmark the permalink.